Why Do Banks Leave Their Vaults and Strong Room Doors Behind? Whilst this may seem a bit puzzling at first, the reason is quite simple – cost. Vaults, strong room doors and large safes such as night safes are extremely heavy, awkwardly shaped and often cemented into the building or bolted down for extra security. Whilst this makes them an extremely robust security measure, it also makes them near impossible to remove without the assistance of a specialist vault and strong room removal company. Removal – Removing the vault or strong room is the costliest option, requiring specialist equipment, however, it’s the only feasible way of re-designing the room without having to factor in the vault or strong room. Door Removal – If you don’t have the budget for a full removal but want to make use of the space, you may find that removing parts like the door means that you can benefit from the space at a much lower cost compared to getting it removed. Repurposing – Repurposing the vault or strong room entirely means no cost is incurred, but the strong frames of the vault or strong room may obstruct further developments or redesigns of the space. The amount of room space you are left with after having your vault or strong room removed is something to consider, if the amount of space saved from removal will be minimal, you may find that removal of the door and grill gate to create a functional space is a more cost-effective option. 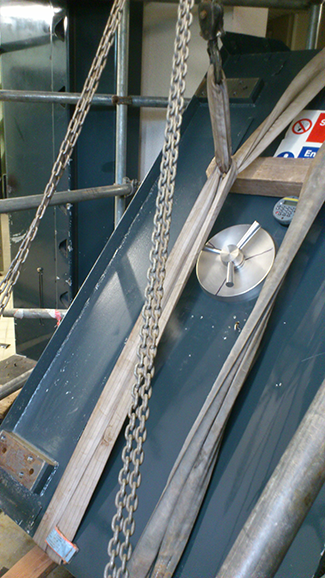 The location of the vault or strong room door will impact the cost and convenience of having it removed. For example, a large night safe located on the ground floor in an easily accessible location will attract lower labour costs than removing a drop safe located in the basement which has been encased in concrete. Cost is a huge factor. As mentioned previously, it is much more expensive to have your vault or strong room removed in comparison to it being repurposed, so you may want to keep this in mind before making your decision. Generally, we find that the vaults and strong rooms we remove are in good enough condition to put back into working order. When a client of ours purchased a building which used to be a building society, they inherited a strong room and night safe which had been encased in the basement. After contacting Thornhill Security and opting to have the strong room and safe removed, we erected a tower at the premises and used a chain block to remove both items, enabling the new owners to repurpose the room. Read the full case study here. At Thornhill Security, we have the skills, experience and expert knowledge needed to provide a cost effective and efficient removal and relocation service for safes, vaults, strong rooms and other large security products. We have all the necessary kit including heavy-duty cranes meaning you only deal with one contractor from start to finish. If you are Interested in our vault and safe removal services and would like to find out more about how we can help you, call us on 0117 6974 994 to speak with a highly experienced member of our team.